SOUTH Lanarkshire Council bosses say a sports facility would not meet the terms of the European funding as the site was to be used to promote opportunities for manufacturing, engineering and training. Proposals for a state-of-the art sports arena on vacant land at Langlands came before councillors last week but appears no closer to getting off the ground any time soon. For while it was agreed that council officials progress negotiations over the plans they accepted this only be done in conjunction with developing a masterplan looking at a range of uses for the site. 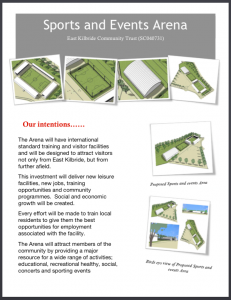 A paper detailing options for the South Lanarkshire Council-owned site at Langlands West, including the proposal by East Kilbride Community Trust (EKCT) to build a multi-million pound stadium, was presented to the executive committee. European funding and money from Scottish Enterprise Lanarkshire, totalling £7.8 million, was secured in 2004 and ground improvement works have been carried out on the site – originally in preparation for the relocation of Rolls-Royce before the company abandoned its plans. 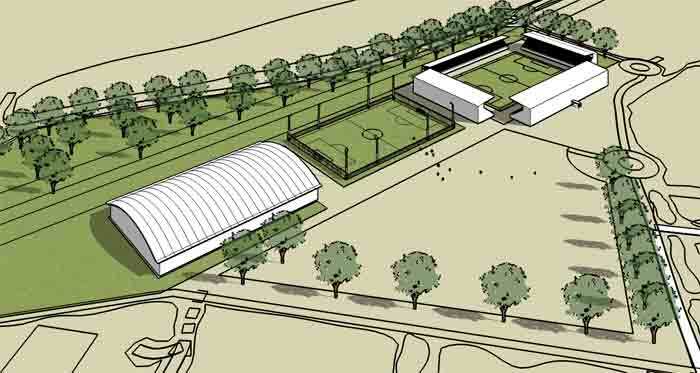 Over the past two years the Trust, a registered charity set up by millionaire businessman James Kean to promote sport and health in his hometown, has put forward a number of proposals for the development of the community-based sports facility, including making a financial offer to buy a small part of the council-owned site. Council bosses say, however, the grant funding was awarded subject to specific conditions including that the site be used to promote opportunities for manufacturing, engineering and training. They claim the authority could face a clawback of up to £1.8m if these conditions, and how the site is disposed of, are not met. They say a sports facility would not meet the terms of the European funding. The Trust’s latest proposal is to build the stadium on land owned by one of Mr Kean’s companies, Jackton Estates Limited, and due to be gifted into the ownership of the charity. This, the council report stated, would require only right of access over the council-owned land, the cost of which was put at £14,700. The Trust, which runs many community-based projects in the town as well as the successful K-Park Training Academy at Calderglen, has consistently argued there would be no clawback of the European funding because the new facility would be for community use. Representatives were due to speak at the meeting but did not turn up. Tory councillor Graham Simpson’s amendment that the council only approve the right of access to the Trust subject to the masterplan process for the site being completed and reported back to the committee was approved. He said: “We have a pretty extraordinary state of affairs. A group has asked to come and speak and then doesn’t turn up. “But then this isn’t the only strange thing about all of this – to offer well below the market value for a piece of council land then nothing at all is a very strange way of negotiating. A spokesman for EKCT told the News the Trust had emailed both the council’s chief executive and principal legal officer two days prior to the meeting, requesting that consideration of the Langlands proposal should be deferred, pending clarification of what the Trust saw as inaccuracies in the report, but had received no response. He said: “In these circumstances, the Trust did not have any right to address the meeting and we have been pressing the council for a response. “It seems the council has managed to create a web of complexity in a situation which is very simple. “The Trust has suggested several ways the council could assist or engage with the Trust to facilitate the delivery of a community stadium for East Kilbride, at no expense to the public purse, and now all we seem to have is the suggestion of yet another masterplan which will have no more prospect of delivery than the council’s previous masterplan for Langlands, which they proposed in 2005 and later abandoned, after spending £8.7 million. “The Scottish Government has already said there would be no clawback of the European grant if the Langlands land is used for community purposes and the council makes no windfall. “The simple facts are that the Trust has land at Langlands which could be used if the council grants access over a partially constructed but presently unused road owned by the council. “Alternatively the Trust has suggested a preferred option to the council that six acres of the dormant 70 acres owned by the council at Langlands be used for the stadium project. “If the council’s best effort here is to propose yet another masterplan it may say much about their lack of interest in promoting East Kilbride, as opposed to other parts of South Lanarkshire.